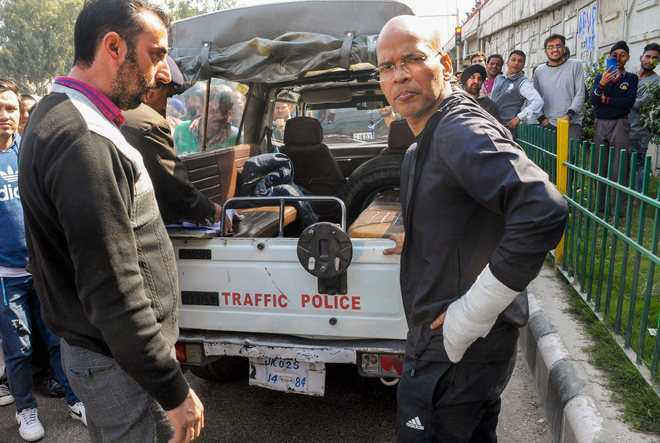 J&K’s top traffic cop Basant Rath on Thursday asked Indian cricket team skipper Virat Kohli “to keep his cricket patriotism to himself”. “Dear Virat Kohli, I love Javed Miandad. You please keep your cricket patriotism to yourself. And to your advertisement contracts,” Rath wrote on Twitter while responding to the recent controversy over Kohli’s “leave India” remarks to Twitterati. “I don’t think you should live in India,” Kohli had told an enthusiast who called the skipper overrated while expressing his admiration for English and Australian batsmen. “Overrated batsman and personally, I see nothing special in his batting. I enjoy watching English and Australian batsmen more than these Indians,” Kohli read out a cricket enthusiast’s tweet. “Okay, I don’t think you should live in India then… you should go and live somewhere else, no? Why are you living in our country and loving other countries? I don’t mind you not liking me but I don’t think you should live in our country and like other things. Get your priorities right,” the Indian cricketer had responded. However, Rath also come under fire for his tweet against the Indian cricketer and his remarks were described as a “publicity stunt and an attempt to appease Kashmiris”. “There is only only difference between king @imVkohli and u... “Woh Pakistan ke against b maarta hai” Jammu Mai Singham aur Srinagar Mai chewing gum,” one of the Twitter users wrote. But his followers from Kashmir have admired his remarks.